Grandstream GXP1400 is a perfect budget IP phone for brand conscious small businesses it is a better alternate to GXP280 and latest model from Grandstream. 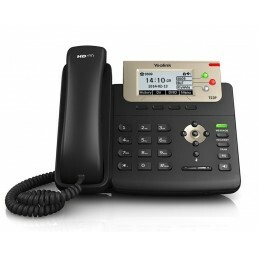 This VoIP Phone has 2 line appearances with single SIP account. 128x40 graphical LCD IP Phone has advance features like 3 XML programmable context-sensitive softkeys,dual network ports, and 3-way conference. HD audio is what makes it better choice over GXP28X series, it is easy to deploy in mass implementation offers automatic provisioning methods. Enterprise grade security in place to protect your privacy and broad range inteoperability with IP PBX and NGN/IMS VoiP applications. Despite having low price this IP Phone is equally liked by quality conscious people.